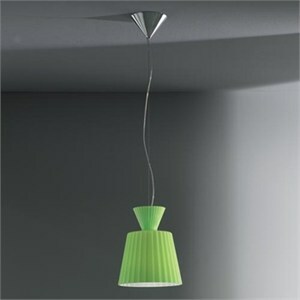 Pendant fixtures with knife pleats of blown glass available in gloss white diffuser. Conceived in large and small sizes. Metal structures with white painted or brushed chrome finishes. Companion wall, table and floor designs are available. Glass diffusers are suspended with cable and a single clear cord, to a cone-shaped, brushed aluminum canopy that mounts directly to a standard 4� junction box. 10 foot cord and cable is standard, but additional is available upon request.